Green-tinged, pearly-fleshed Galia melon. Glorious alone, or adding perfumed sweetness to a fruit salad or smoothie. But you’d be missing out if you didn’t also try its delicate, juicy flesh paired with savoury food like tangy cheese or salty ham. For a refreshing treat, make your own ice lollies. Just blend the flesh of a melon with the juice of a lime, pour into ice lolly moulds and freeze until set. Or freeze into beautiful perfumed granitas and sorbets for a refreshing dessert. Galia melon is also good tossed in salads – especially with the piquant accompaniment of black olives. Before cutting, you can store Galia melons at room temperature, but after you cut them, they need to be wrapped and put in the fridge. 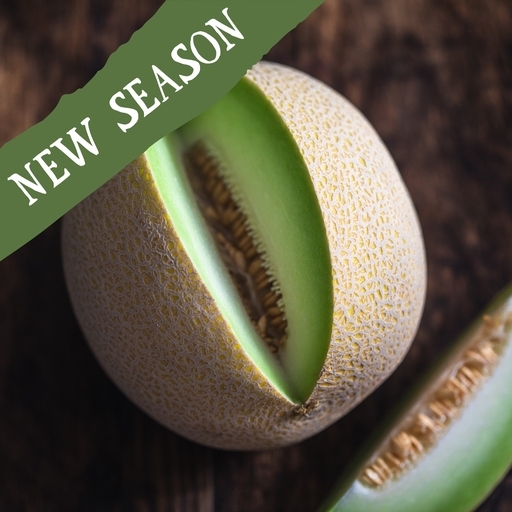 Galia melons are originally from Israel but are now grown in Brazil, Morocco, Spain, Southern U.S. regions, Costa Rica and Panama.